I’ve kept the 3-screw coarse approach mechanism since it’s compact and rigid. The tube scanner and approach screws are in the the lower part, and the tip and preamplifier in the upper part. This way, I can easily swap between STM and AFM heads (still a ways to go on the AFM part). The sample mounts to a magnet glued to the end of the tube scanner. 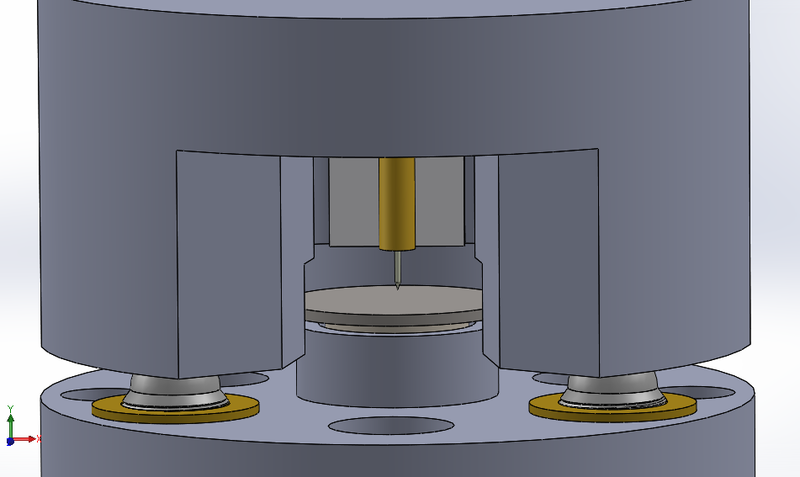 The coarse approach mechanism has to be able to bring the tip within the tube scanner’s vertical travel range, so that the scanner can find the sample. This is done by stepping the approach motor, then extending the scanner to search for the sample surface. If it detects the surface, it starts scanning, otherwise the scanner retracts and the motor takes another step. This is called the “woodpecker” approach method, and it prevents tip damage since the motor and scanner are never moving at the same time. I’ll be using the 28byj-48 stepper motors, since they are geared down to about 4096 steps/rev. Since these are dirt cheap, I might as well put one on each approach screw so the approach is always done vertically. 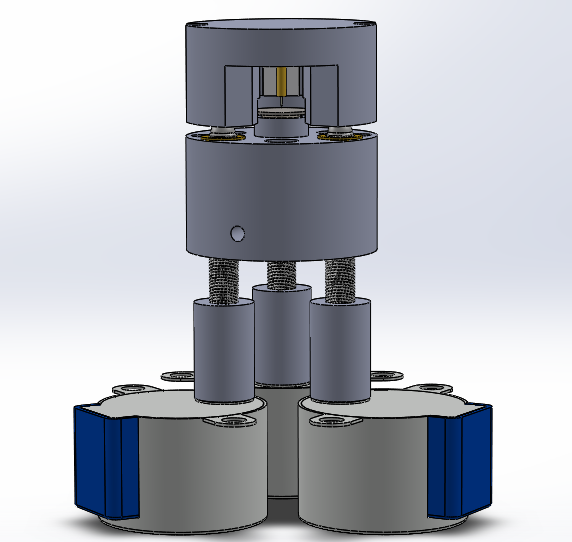 The motors can be stepped sequentially to maximize resolution. Each motor drives a 3/16″-100 screw (moves 254 um/rev), so resolution will be 254 um /4096 / 3 = 21 nm steps. Not bad! 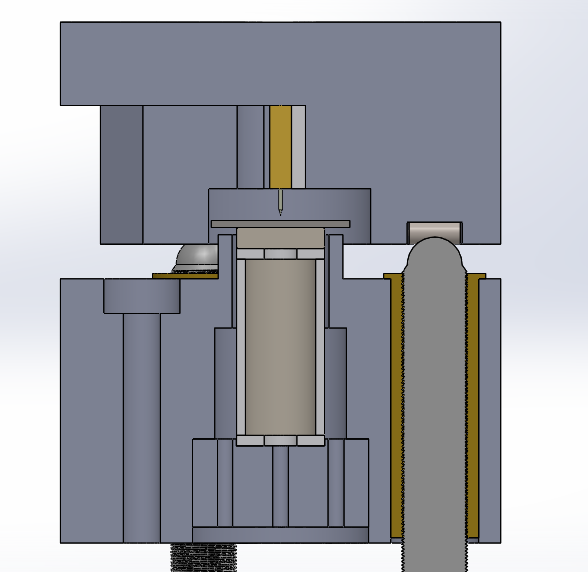 I’ll probably full-step the motors to double the step size since this is smaller than necessary. Having a small step size makes it possible to center the scanner in its travel range after detecting the surface. I’ve been following your work for the last week or so. I originally intended to build your first generation STM, but it seems you have decided to move to a more rigid scanning head! This post is from late 2015, I was wondering if you had made any progress on the new design and electronics and if it would be available for release at some point in the near future. Hope your data is plenty and your defense is a success. Yeah, this post is a bit old haha! I’ve just been really busy with work lately and haven’t had a lot of time to work on this project, but it is slowly progressing! The new scan head and electronics will be a combined STM and tuning-fork AFM. I have most of the schematics drawn up and most of the FPGA stuff working, and will release everything once it’s all up and running. I plan to start posting updates again once I get around to building more of the hardware. I’ll also be releasing a new PCB design soon for the first scan head. It’s very similar to the old one, just integrates the analog stuff, power supply, Teensy, and motor drive onto one board. is the top cap kept in place by its own weight, or will there be a spring/elastic band? It’ll be held down with springs, just like in my previous design.